I’m working on a paper for the Society for New Communications Research on “New Media, New Influencers and Implications for Public Relations Professionals” to be presented at the Society for New Communications Research Symposium here in Boston in December. I’d appreciate it if people would be willing to complete (and share) a survey on the topic. There are actually two surveys – one aimed at communication professionals and another for general consumers. In addition, we’re looking to include case studies on how companies are adopting and applying new media/social media programs. Please let me know if you know of companies that might be interested. You can reach me at gpc AT pevco DOT net. 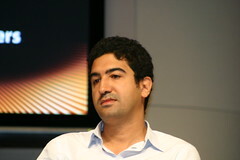 The panelists were Kevin Rose from Digg, Tariq Krim from Netvibes and Garret Campbell from Stumble Upon. Jason Pontin, the editor in chief for MIT’s Technology Review was the moderator. Pontin presented the panelists as founders of some of today’s most exciting Web startups and said that they would unveil what’s next for their companies and reveal the impact it could have other companies. I’m not sure if that exactly happened over the course of the discussion. Pontin started the session by polling the audience about their media consumption habits using the nTag badges we all had. The polling process was a little clunky but the bottom line was that the audience had pretty mainstream habits – relying primarily on traditional media. His first question to the panel was what what game each company was changing. Campbell described Stumble Upon as a Web discovery service that allows users to rate sites and content and then provides suggestions on additional based on the likes and interests of with similar profiles. The site currently has about 3.5 million users. Krim described Netvibes as a personalized aggregation service that allowed people to put everything they care about onto a single page. He described it as widgetized content. Rose explained that digg started as a social news web site allowing people to share found news and content with the masses and rate the news to move it up or down the site. None what they said was especially enlightening but it was good to hear each of them describe their businesses themselves. Pontin’s next question was on how media consumption habits had changed. Campbell said that the biggest difference was that the media was now a two-way street with users able to and increasingly expecting to be able to rate and respond to stories. According to Rose, it took a while for people to grasp the concept of digg. He’d been using del.icio.us and Slashdot and saw digg as an experiment to see what would happen if you gave complete editorial control to the community. Krim was overwhelmed by the volume of information he had to deal with and sees all of us facing “attention competition.” The task of managing our attention is one of the biggest changes in how we deal with the media. I thought all three panelists made some pretty cool points – especially the idea that we can use technology to better manage or relationship with content and the media. As a digg user, I think it’s pretty safe to say the the experiment worked. The next thing Pontin asked about was the role of trust for each of sites. On digg, according to Rose, trust is everything. He tried to equate more diggs with more interest and therefor more trust. That seemed like a bit of a stretch – popularity doesn’t necessarily mean accurate content. He did say that the source of the content didn’t really matter that much since it was up to the community to filter the content. Because Rose understands that the front page stories aren’t of interest to everyone, digg also provides additional filtering tools – by topic, friends, etc. In the future digg will be providing a suggestion service which offers stories based on what has been dug by a user in the past. Not surprisingly, both Campbell and Krim also thought trust was important. Campell said that they think it’s important; but that it’s also important to find and connect like-minded people so they can create create clusters of similar people and allow people to get and share info. Over time, he expects Stumbledupon to become more social. Krim made the point that people are providing more and more personal information on social sites and how these various services use this information is critical. None of the panelists really addressed the issue of trust very well but all of them were happy to talk about it. The issue at hand was, I think, the degree to which the content on these sites could be trusted rather than the trust relationship between members or between members and the sites. Pontin’s next question had to do with how content sources – like the Tech – would be compensated. Who’s going to pay for content creation? None of the panelists seemed to get the question and each of them instead chose to talk about the business model for their sites. 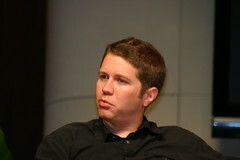 Campbell said that advertising has been effective; but that paid content or membership sections were also viable models. Rose pointed out that “content is king” and that he’s seen several part-time bloggers that have been able to do it full time because their content attracts enough readers. He also pointed out the New York Times has taken down their paid wall because they are making enough from advertising to open up the site. Krim acknowledged that this is an issue, but he took the conversation in a different direction by suggesting that the advertising market needs to keep pace with audience interest. His point was a perfect segue to Pontin’s next question, which was whether the panelists thought advertising would change. Campbell thought that it would because it would be important (and beneficial) to understand which advertising matters to whom. He also thought that giving users the ability to rate ads so they could be better targeted made sense as well. Rose sees a blurring between advertising and other content. On digg people often share ads that they find funny or interesting. He also pointed to the example of a kitchen remodeling company that posted what were essentially advertising messages into a blog post that was popular on digg. Krin said that it was important for social media to have social advertising and that advertising needs to provide a real service to the user, not just information. Pontin also wanted to know how important other media types – in particular video – factor into the three sites. This seemed like kind of a simplistic question since all three of the sites already provide some degree of access to other media. Campbell thought that media diversification was important and that after text they offered photographs and that video was on the horizon. Music was another that he sees in the future. Overall, he sees a shift in the amount of time people spend with different media types and he wants to make sure they are able to provide what’s of interest to Stumbledupon users. Krim said that in the beginning, people were using NetVibes for RSS aggregation but that now people are adding all sorts of content types. He sees content as the key to user attention and engagement. According to Rose, digg’s value comes wherever there is too much content for people to sift through. Today the site is primarily text, video and podcast but there will be other media types in the future. Next Pontin asked about Twitter , Pownce and microblogging in general. He asked for a show of hands and it turns out that very few people in the audience were Twitter users. Given the fact that Rose started Pownce, he started the discussion. He started using Twitter himself back in March at SXSW and though it was really useful for connecting and keeping track of people at the event. He said that Pownce serves a different function. It’s a way to share media files within a community. If Twitter is all about the mobile experience, Pownce is about being at the computer sharing content with friends. Krim thought said that you need to understand tools in the context of the community. He Twitters because he travels and has ended up with lots of people following him. He told a story of visting the Apple store and Twittering about the iPhone. He was called by two reporter right away who wanted to interview him about the phone. In his opinion, these are tools that the wireless carriers should have provided. all of this is about community and the carriers ought to have used it. Campbell added that microblogging is cool because it combines information and expression. Pontin’s last question to the panel was what they thought of as Facebook as a challenger to each of their companies. Rose said he met with Mark Zuckerberg before Facebook launched the application project, who said he wanted to become the social network and to work with companies like the ones on stage to create applications for the network. At this point though, he thought that many of the apps were kind silly, pirate vs. ninja kind of stuff. He thought that this reflected the way people used Facebook – more for social connections rather than for information. Krim saw the value of Facebook in the fact that it has made it possible for more to get involved. He raised the issue of privacy and worried that there was a risk in the monitization of context – particularly as it relates to private information. All in all, it was a pretty good discussion and all three of the panelists shared some interesting points. Aside from having to run to San Francisco for a quick meeting (no really, I like day trips to California) this is shaping up to be a great week. Why? Because Thursday night is just chuck full of good events. I’ll be starting my evening at the kick off for the MIT Communication Forum Fall series. The Comparative Media Studies program and the Media Lab have come together to create the new MIT Center for Future Civic Media and Thursday night’s forum will ask the question. “What is Civic Media.” It’s going to be happening from 5:00 to 7:00 in the Bartos Theater at 20 Ames Street. I’m excited to see these two groups put their heads together around technology, emerging media forms and civic engagement. 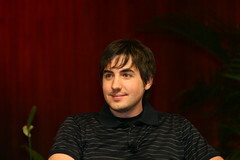 Chris Csikszentmihalyi is Muriel R. Cooper Career Development Professor of Media Arts and Sciences at the MIT Media Lab. Henry Jenkinsis co-director of Comparative Media Studies and the Peter de Florez Professor of Humanities at MIT. Beth Noveck is professor of law at New York Law School where she directs the Institute for Information Law & Policy. Ethan Zuckerman is a fellow at the Berkman Center for Internet and Society, Harvard Law School, and co-founder of Global Voices. It should be terrific and will serve as a great beginning to what promises to be a solid series of events. Later that same night – and not far down the road – will be the first Social Media Club meeting of the Fall. Business Wire is sponsoring a panel on the social media lessons learned by corporate America. In my role as the programming director for the Club, I helped pull this panel together and am really excited by the topic and the speakers. The only thing that bums me out is that I am going to be late; but there isn’t much I can do about that. Steve Restivo, Director of Corporate Affairs, Wal-Mart Northeast, will discuss how America’s biggest retailer has started to put social media to work and the lessons they have learned along the way. Monika Maeckle, Vice President, Southwest Region, Business Wire, will moderate. Monika has been deeply involved in the development of Business Wire’s EON suite of services, a web only social media platform. Maeckle is also the author of many of Business Wire’s SEO tip sheets and blog posts. Things will be kicking off on Thursday, September 2 at 6:30 at the Newton Marriott so be sure to come on down. You can find more details – and a registration link – on the Social Media Clubwiki. Both events are going to be good so try to make it to one or both if you can swing it. Another WebInno is in the books and they just keep getting bigger and better. I remember the first one I attended, in July 06, there were probably 75 people in the room and I was impressed. Last night, there were more than 600 people registered for the event and judging from the size of the crowd it looked like most of them showed up. There were nine companies at the event and I was able to catch up with seven of them at the event. Here’s how what I saw stacked up with what I expected. . .
Frame Media – Frame Media does content and tools for wireless digital picture frames. As screen prices come down and our expectation to consume content goes up, it’s easy to imagine more and more placements for these types of devices. And it makes so much more sense than either non-digital signage or ones that need wired connections or on site updates. Content that can be changed on the fly depending on the time of day, specials, proximal demographics, etc. Sounds pretty cool to me. Expectation that I’ll be wowed – I have high hopes for this one. Partly because I can get a bead on it very easily and also because it fits well with the increasingly visually cluttered world we seemingly have chosen to create for ourselves. I’m expecting that this is going to be very gee-whiz and glitzy. Chances that I’m way off base – I guess it’s possible but I don’t think so. I missed this one by a mile. For some reason, I assumed that they were targeting commercial screens – airports, malls, coffee shops, etc. – and if that had been the case it would have been cool. Instead, these guys want to wirelessly send content to people’s personal frames – news feeds, Flickr photostream, etc. So far, so good. The problem is that some of the content they will be sending is advertising. Like we don’t get enough of that shoved into our heads already . . . There is a no ad option, but that will cost you around $5 per month. Five bucks to have my content streamed to my device? No thanks. There are already plenty of options out there for streaming content is it is – but of course those are more involved and not so easy as what Frame Media has to offer. So I could see it as being pretty appealing for non-tech savvy relatives – but will they have wifi? And do you really want to give someone something that’s going to push ads? Pushed content – no matter what it is – can get annoying after a while. GoLoco – As someone on the verge of giving up his in-town parking in favor of public transportation (starting October 1st . . .), I’m pretty interested in what GoLoco is doing. Basically this is a ride sharing service that lets you meet and connect with people with a shared destination (more or less) on Facebook. I signed up and checked it out and while there were 24 rides in my area, none of them were especially helpful (of course I didn’t enter any of my own travel needs either . . .). I like the fact that they are working within an existing social network but wonder the degree to which this will limit the potential member base. Expectation that I’ll be wowed – I really want to be wowed. I think it’s a great idea and I only hope that they get enough critical mass to make it happen. Chances that I’m way off base – I think I get the idea here and am confident in my expectations. While I wasn’t wowed – I still think this is a solid concept. The fact that it’s only on Facebook is a temporary limitation (they are planning to tap into other networks in the future) and the model – 10 percent of the fee – seems easily lost if people just agree on a direct payment. DesignMyRoom – My daughter loves any number of virtual world sites that let her design and furnish living spaces for whole armies of avatars. Looking at DesignMyRoom, I got the feeling that this is the grown-up version – the big difference being that this site gives you the means to translate your online fantasy into reality by generating a shopping list of the materials and items you’ll need. They remind me a little of MyDesignIn which was featured at WebInno11. Expectation that I’ll be wowed – Well, MyDesignIn was pretty cool so I’m expecting a lot from DesignMyRoom. Chances that I’m way off base – Not high, I think that what they are doing is pretty straight forward and they seem to have the relationships needed to make this work. I liked this one – it was simple, solid, had a clear utility and business model, legit partner relationships, solid offering all around. It is different from MyDesignIn in that MyDesignIn is more focused on the nuts and bolts of remodeling – can I put the sink here, how much room do I have for windows on that wall, etc. DesignMyRoom is much more about the fun design side of things – how would these drapes look with this couch, should I put a hutch against that wall, etc. It is a faster and more fun process. The fact that it shows the items and quantities you’ll need for a project is also very nice – it makes the design you’ve done on your screen something you can imagine doing in real life. Color me impressed. Fafarazzi – There are few things in the world that I hate more than celebrities. That makes this company – which offers a fantasy-sports style game based on how often your celebrity appears in the media just about the most terrible thing I can imagine. If you are into tracking how often these people appear on the pages of Us, go crazy but count me out. Expectation that I’ll be wowed – I would be wowed if this were based solely on celebrities taken out of circulation by incarceration. Chances that I’m way off base – Not a chance. So these were the first guys I saw when I walked in and I was kind of primed to be a jerk just because I hate the whole idea of celebrities. The thing is, the guys behind this are cool and it’s not a bad idea. To capture the jock crowd, they’re doing Dirtlocker – which allows you to create a fantasy team of athletes based on their publicity rather than their on-field performance. SNIF Labs – A few years ago I worked with Streambase. They were focused on processing real-time streaming data. Their founder, Mike Stonebraker, used to talk about the coming wave of sensor-based data. Somehow, I don’t think this is what he had in mind. SNIF provides a wearable tag that monitors a dog’s movements throughout the day and allows that data to be analyzed in a number of ways. It sounds cool but I have to wonder about the real utility of this. I mean dogs and people have been together for thousands of years and it’s hard to imagine that knowing exactly when your dog took a crap or humped someone’s leg is going to enhance that relationship. Expectation that I’ll be wowed – All that said, I will probably want one of these. If not for my dog, I may attach it to myself to get a better sense of what I with all of my time. Chances that I’m way off base – With this one I’m not so sure, I’ll bet I have it wrong. I was kind of bummed that this wasn’t a real time feed. Basically, when you get home, you pop the sensor out of Fido’s collar and put it on a base station. That base station send the data to your computer where you can pour over the day’s canine antics. Lots of people seemed to be into this company but I don’t know, I feel like it’s a violation of trust, you know what I mean? The fact is though that it’s a cool technology and the guys behind it realize it has more interesting future applications. For the time being though, it’s all about the dogs. You’ll be able to get one in time for that holidays for around $200. The UpDown – Do you remember how popular day trading was in the late 90s? Maybe you were into it yourself or had friends who were? Well, The UpDown Investing Community seems intent on bringing back those thrilling days of yesteryear. But instead of investing individually and directly, UpDown seems to be creating a fund that is managed based on community input and analysis. I’m looking forward to a conversation with these guys, the idea seems interesting but it’s not a simple story. Expectation that I’ll be wowed – High to very high. I’m not an especially money-centric kind of a guy so it doesn’t take much to impress (of confuse) me. Chances that I’m way off base – Pretty high. I am also not stupid so it may turn out that this isn’t really that cool. TheUpDown describes themselves as “fantasy sports for investors” and that’s a pretty apt description. Members are given $1M to invest as they see fit. The collective intelligence of the “investors” is used to manage a real fund – a portion of which is distributed to the most successful members. I’m less confused than I was before but I’m still not sold. Guitar Star – Guitar Star is just one of several titles by AdME (Advertising-driven Mobile Entertainment. I read the site and was kind of confused. Who are they marketing to – users? carriers? content companies? I’d imagine that the carriers are the key but the way they describe the product on the site sure sounds like it’s targeted at consumers. Expectation that I’ll be wowed – Rockin’ out on my cell phone keypad doesn’t get me as excited as perhaps it ought to, maybe once I see it and try it I’ll be blown away. Chances that I’m way off base – I don’t think so . . . I didn’t have a chance to see Guitar Star – sorry about that . . .
Mobleo – Think del.icio.us meets the cell phone. I like the idea of being able to bookmark sites on my phone. Navigation can be so annoying on my phone that anything that makes it easier – whether better bookmarking or social bookmarking is good news as far as I’m concerned. Expectation that I’ll be wowed – I have pretty high hopes for this one and am looking forward to checking it out. Chances that I’m way off base – High, I could find myself dealing with a cryptic interface and a whole lot of no fun. I also didn’t have a chance to check this one out either. Oncero – Looking at this site, I wondered, “how is this different from LinkedIn?” They promise the ability to find qualified candidates through referral networks. Obviously this is a good idea but there seem to be plenty of ways to do this already so they’ll have to demonstrate a differentiation that didn’t come through on the Web. Expectation that I’ll be wowed – Very low. First of all, this isn’t an issue that touches me very directly and secondly, I am already involved with so many social networks that the idea of another one that is so focused has limited appeal. Chances that I’m way off base – Pretty high, I can imagine that they’ll show me something that is cooler that I can imagine. The idea here is that people don’t really use their referral networks very effectively when it comes to recruiting and I can believe that. When the issue has come up at work, I give it thought for a few minutes but then my mind drifts to other things. These guys think they have a tool to help make referral recruiting work. At its root is money – money for referrals. Now most companies do this but very few do it outside of their employee base – Oncero lets you do that. They also let you see who among your network has viewed a position, how actively they’ve shared that position with others, etc. The demo showed some very fine data – to the point that it might be too much for a non-hiring manager to wade through. I can imagine that if you were a hiring manager (or an HR person or even a business owner) this would be a very cool and useful too. So that was the line up from last night. It was a good set of companies, a good crowd and a great time. There’s no event in October (which is a bummer) but look for WebInno15 in early November. And let me know what you think of my assessment of these companies – was I right or wrong? I’d love to hear. I like summer as much as the next guy; but after a while, it starts to wear thin. Why, you ask? Because it’s a pretty slow time for events and whatnot and they’re some of my favorite things. Now that September is here everything is ramping up again and I’m ready. Just in the next couple of weeks there are several. You’ve got WebInno14 on the 10th (see below), the kick off of the MIT Communication Forum on the 20th and the Social Media Club that night as well. I’ll get to all of them in due course but for the time being, here’s my preview of WebInno. So there you have it, a quick preview of the companies that will be at WebInno next week. Come and check it out to see if my takes were dreams or duds. I’ll fess up myself after I’ve had a chance to check out what each of the companies has to say for themselves.